The name "Reference" stands for extraordinary precision and accuracy, a long service lifes and an ergonomic design. The new Reference 2 boasts these proven premium characteristics with its state-of-the-art technolgy, making it a reliable partner for you and your work. The time saving single-button operation is unrivalled in the new multichannel versions. The Eppendorf Reference 2 is our premium product. Besides improved of its ergonomics the focus design lay on providing the most accurate results possible, optimum user safety, reliability and robustness for a long service life. 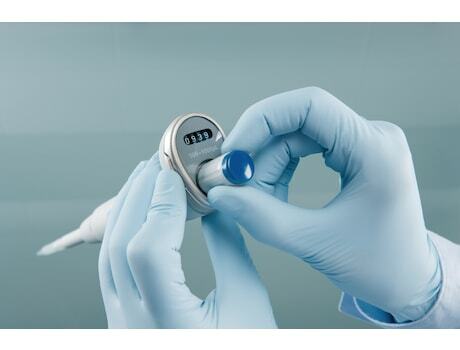 The innovative single button operation is not only fast and easy, but it also allows active aerosol1) reduction and thus protects the user, the sample and the pipette. The sturdy handle manufactured with stainless steel protects the pipette from impact and in combination with the spring loaded bumpers the Reference 2 is likely to stay within calibration even if it takes a fall. These high levels of security make the Reference 2 ideal for use with precious liquids, or in any application requiring extremely high levels of accuracy. When there can be no compromise on quality and reproducibility, Eppendorf’s Reference 2 is an ideal instrument for these Liquid Handling applications. Lower Operating forces for aspiration/dispensing/tip ejection limit strain on the user. Allows users to move more quickly through their pipetting tasks by not having to move the thumb from side to side to eject tips. With the ability to eject a tip immediately following dispensing, aerosol contamination of your pipette is considerably reduced.